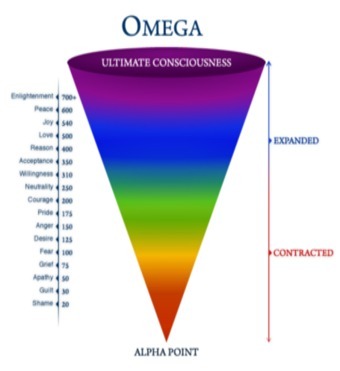 The Map of Consciousness identifies consciousness (on this planet) on a scale of 0 to 1000 with anger, fear, etc., catalyzing the lower end of the scale and Love, Joy and Peace engendering the upper end of the scale with enlightenment at the top. This map introduces the importance of Courage (at 200) as the break point in the Map and the beginning point in the ascent of consciousness. Courage is that beginning point and catalyst for freedom from the lower realms. Even more interesting, the Map capably displays levels of consciousness as reflection of resistance. As one is more resistant, they are lower on the scale. As one is more allowing, one is higher on the scale. As we move away from resistance; as we become more allowing, we become more conscious. As we become more conscious (less resistance), more Innate Intelligence naturally expresses through us. After all we, like everything else on and off this planet, are a mechanism by which Innate Intelligence expresses itself through us (for which we get the ride of a lifetime! Someone in history once said, “In god, we live and move and have our being.. It is still a true statement. The Map of Consciousness is exponential. Power vs Force is highly recommended reading. This information is summarily covered in Visionaries Thrive In All Times Chapter 9, Intent.